WASHINGTON — U.S. allies, blindsided by President Donald Trump’s pledge to slap stiff tariffs on steel and aluminum imports, scrambled on Monday to secure exemptions even as the president remained defiant in his pledge and White House officials sent contradictory messages behind the scenes about the eventual actions. From Washington to Beijing, officials have warned that any such measures by the Trump administration could be met with retaliation. 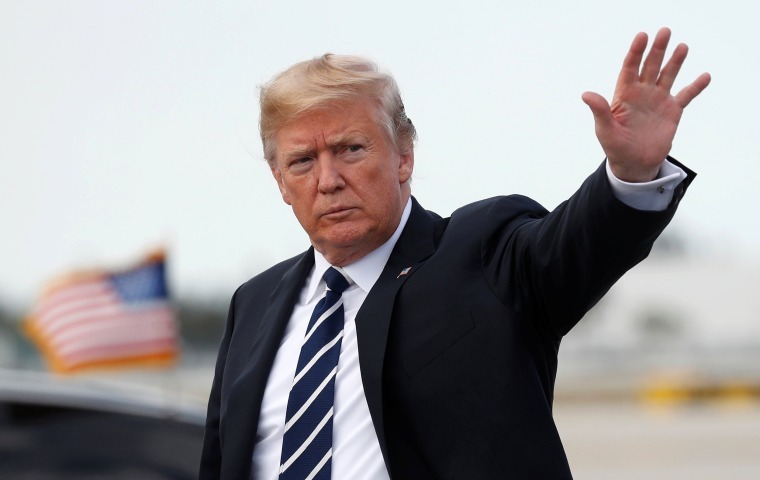 Trump insisted on Monday that he is not looking to start a trade war, although he repeated his assertion from last week that they are good for the U.S. economy. Trump also threatened America's neighbors and closest trading partners — Canada and Mexico — saying Monday that the proposed tariffs would only "come off" for those nations if they are able to renegotiate the North Atlantic Free Trade Agreement in a manner that he finds "fair." "If we don't make a deal I will terminate NAFTA," Trump said. "But if I do make a deal which is fair to the workers and to the American people, that would be, I would imagine, one of the points that we'll negotiate. It will be tariffs on steel for Canada and for Mexico." Canadian Prime Minister Justin Trudeau has called the tariff proposal “absolutely unacceptable,” and Canada's foreign minister, Chrystia Freeland, has threatened retaliatory measures if Canada isn’t exempted from the trade actions. "We will continue to engage with all levels of the American administration in the coming days so that they understand that this proposal is unacceptable," Trudeau said on Friday. As allies, including Canada and the United Kingdom, raced to secure carve outs from any official policy, moderate White House advisers worked behind the scenes to stop Trump from rushing to any policy decisions that haven’t been thoroughly articulated. Conflicting schools of thought on trade-related issues have surfaced yet again among White House officials, according to three officials who spoke to NBC News. Trump’s top economic adviser, Gary Cohn, worked to assure allies in recent days that no policy had been signed and that their concerns would be taken into consideration. Commerce Secretary Wilbur Ross and economic adviser Peter Navarro prefer isolating countries like China where a trade imbalance exists. Ross on Sunday cautioned against expectations that the president might backtrack on the plan. “The president has announced that this will happen this week. I have no reason to think otherwise," Ross said on NBC's "Meet the Press." In a phone call Sunday with Trump, U.K. Prime Minister Theresa May expressed “deep concern at the president’s forthcoming announcement on steel and aluminium tariffs, noting that multilateral action was the only way to resolve the problem of global overcapacity in all parties’ interests,” according to a statement from her office. The White House readout of the phone call, sent a day later, focused only on discussions about the conflict in Syria, omitting any reference to their discussion on tariffs. The president has already sent mixed signals over whether his intentions amount to triggering a trade war. On Friday, Trump tweeted in support of trade wars, even after warnings from governments including China, Mexico, Canada and the EU. "We are extremely worried about the consequences of a trade war." As the world’s biggest steel importer, the U.S. relies heavily on exports from countries like Canada and Mexico but less so on China, which was the 11th biggest steel exporter to the U.S. last year, according to the Department of Commerce. The president accuses China of flooding the market with cheap exports, but steel and aluminum make up just more than 2 percent of total U.S. imports. Meanwhile on Capitol Hill on Monday, Republicans — including House Speaker Paul Ryan — lashed out at the president's announcement. "We are extremely worried about the consequences of a trade war and are urging the White House to not advance with this plan," Ryan spokeswoman AshLee Strong said in a statement Monday morning. "The new tax reform law has boosted the economy and we certainly don't want to jeopardize those gains." Even as U.S. and Canadian officials race to secure some sort of industry or country carve out for the United States' biggest supplier of steel, Cohn does not want to mention it publicly since his goal remains getting Trump to reverse himself, according to two sources familiar with his stance. The tariffs announcement also signals how Trump may conduct policy differently now than in the first year of his administration. After spending 2017 hewing to a traditional Republican agenda of overturning Obamacare and securing a major tax cut, Trump is enjoying the chance to show his independence from GOP congressional leaders. In particular, he is relishing the attention he’s getting from the labor community, which he courted with promises of a major infrastructure plan and tougher trade laws during his campaign. Privately, Trump has been marveling to aides about praise he’s getting from AFL-CIO President Richard Trumka. “For years, we have called attention to the predatory practices of some steel exporting countries,” Trumka said in a recent statement. “We applaud” the president's tariff decision, he said.